Those were the words of Milos Raonic after he survived a scare in the Round of 16 at the Australian Open on Monday. It wasn’t easy, it wasn’t pretty, but Raonic is off to the quarter-final after defeating Roberto Bautista Agut of Spain (7-6, 3-6, 6-4, 6-1). The world’s #3 player, Raonic is the highest seeded player remaining in the tournament, a first for him in a major. Raonic got off to a great start, jumping out to a 3-0 lead in the first set. He broke Bautista Agut’s serve, converting on his fourth break point chance. He nearly made it 4-0 on the 13th seed in the second service game, but failed to convert on six break point chances. Raonic looked to be in full control, and then out of nowhere, the set got turned on its head. With Raonic holding a 4-1 advantage, the Spaniard had his first easy service game to make it 4-2. Then, Raonic’s serve abandoned him. Raonic double faulted twice in the seventh game while in the process of giving every point to Bautista Agut. Just like that, we were back on serve. Raonic had a break point opportunity in the next game, but didn’t capitalize, and each player held serve the rest of the way, forcing a tiebreaker. Raonic, who was 27-14 in tiebreakers in 2016, did not start this one very well. With Raonic seemingly shanking everything hit to him, Bautista Agut jumped out to a commanding 5-1 lead. But the Canadian didn’t panic, instead working his way back into the tiebreak, winning the next five points and eventually winning 8-6. 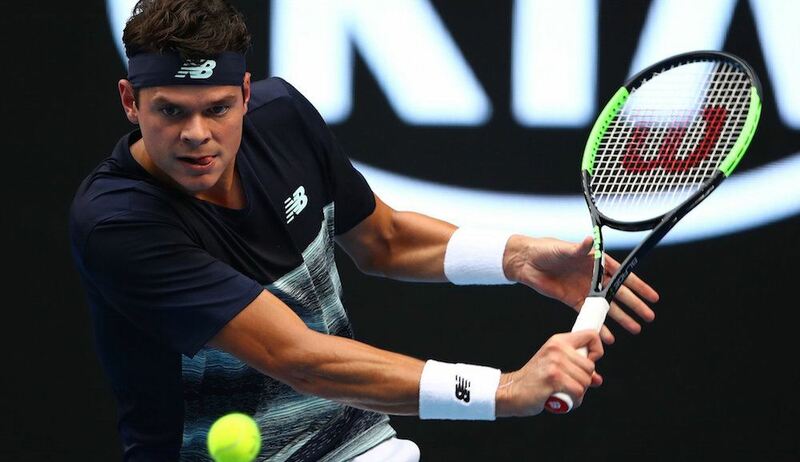 Raonic rode the momentum of his tiebreak win into the second set, taking every point off Bautista Agut’s first service game for a 1-0 advantage. But Bautista Agut wouldn’t go away easily. He broke back in the fourth game, and then broke Raonic again in the sixth game. Bautista Agut trekked on, holding serve for the rest of set, winning 6-3. The third set began with a slight delay because of rain, allowing Raonic some extra time to cool down, and calm down. Both players held serve until another delay because of weather, and consequently they had to wait for the roof to close. With the score tied and Raonic serving, Bautista Agut appeared to have the Canadian on the ropes. Raonic was frustrated, throwing his racquet in disgust at one point, but managed to hold off three break points. Raonic battled, and held on to take a 5-4 lead. From on the ropes to in the lead, Raonic jumped on Bautista Agut in the very next game, breaking the 13th seed to take the set. Raonic, who looked so out of sorts for much of the match, regained his composure in the fourth set. He hit a big return winner to break serve in the second game, taking a 2-0 lead. In the fourth game, Milos struck again, taking every point to go up a double break. From there, it was smooth sailing for Raonic, holding serve the rest of the way for a 6-1 win in the fourth set. Raonic will get his toughest opponent of the tournament to date in the next round, as he faces Rafael Nadal.